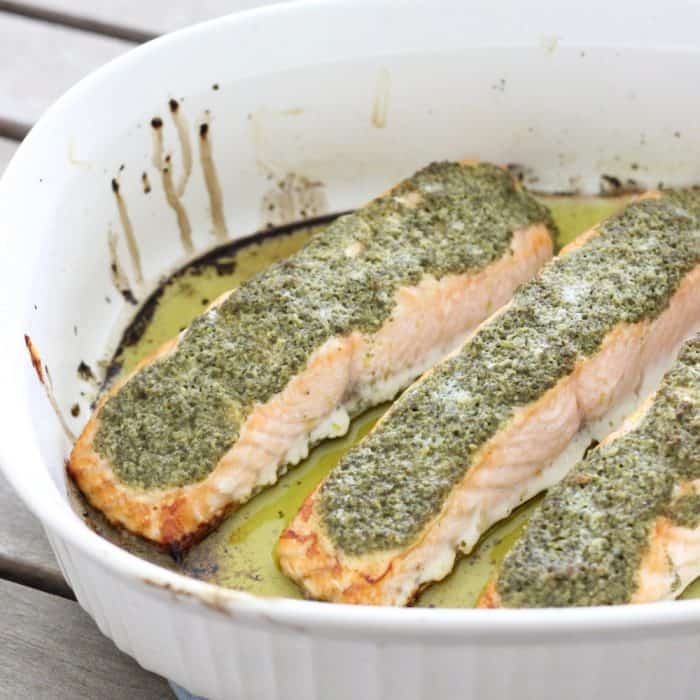 Healthy, easy oven baked Pesto Salmon with lemon. Only five ingredients needed for this tasty, rich, and satisfying salmon dish ready in under 20 minutes. 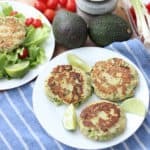 Need easy recipes that require very little work and very little oven/cooking time? Then this Pesto Salmon is for you. It’s incredibly easy with practically no work involved. 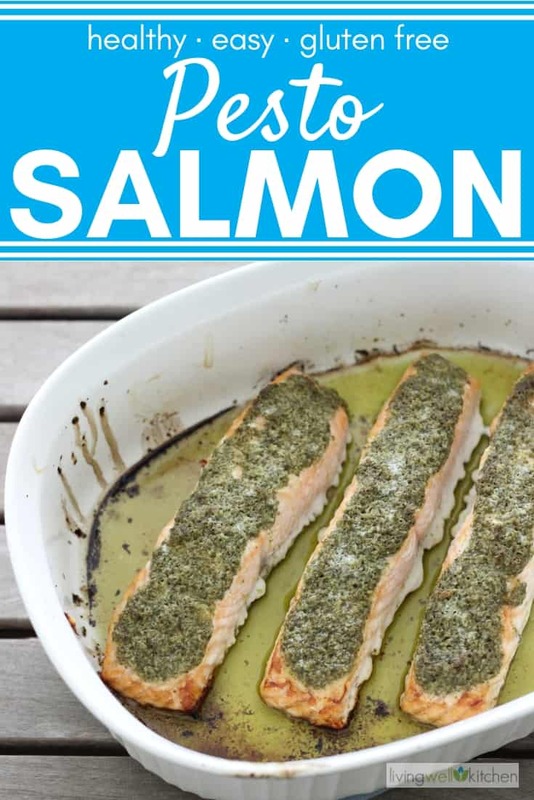 You basically just spread some pesto on salmon fillets and pop it in the oven. Pesto salmon is exactly what the name implies. It is salmon fillets covered in pesto and lemon juice and baked. 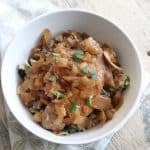 It’s flavorful, easy, and delicious. 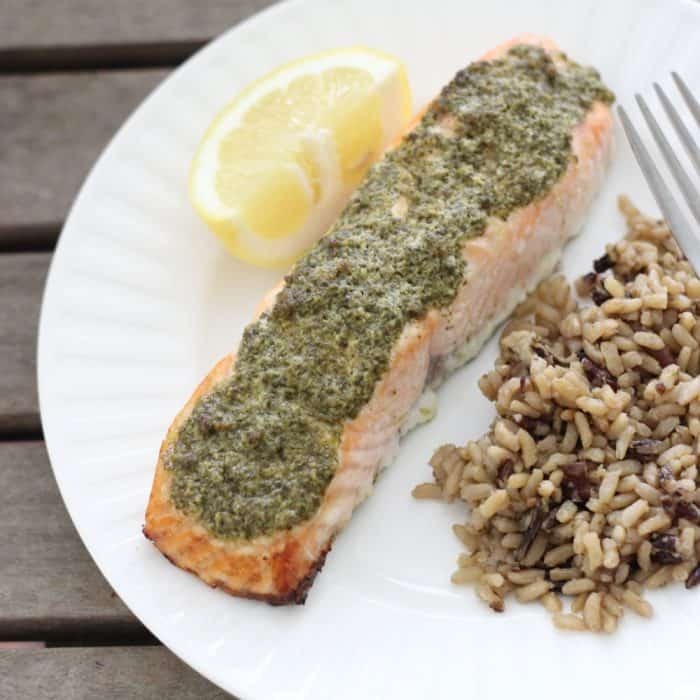 Easy Pesto Salmon requires only a few ingredients: salmon, lemon, salt, pesto, and olive oil. The pesto and salmon work so well together, and the richness of the two is cut with a little lemon juice to brighten the flavor. Add salmon to a baking dish, skin-side down. If you use skinless, you can rub one side with olive oil and place it oil-side down. Squeeze lemon juice over pesto, and sprinkle with salt. Bake then broil until done. Salmon: I prefer wild caught Alaskan salmon or farmed Alaskan salmon in indoor recirculating tank or farmed Chinook salmon in Marine net pen. When picking salmon, I like to look for a label that shows that the fish has been eco-certified by the Marine Stewardship Council and/or Aquaculture Stewardship Council. You can use salmon fillets with or without skin. Pesto: Any pesto will work. I used one that I found in my sister’s pantry because I was too hungry to make my own, but I usually prefer making it myself. P.S. If you have leftover pesto, you should most certainly try out this equally easy pesto pasta and this Mediterranean Meatball Flatbread. 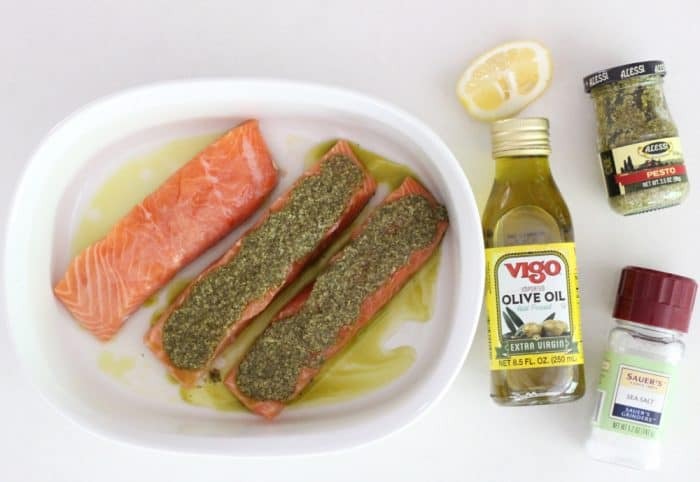 Olive oil: To be honest, the olive oil is only necessary when using skinless salmon fillets. When using fillets with skin, skip the olive oil since the salmon has enough natural oils already in it. Lemon: I used fresh lemon in this recipe, but you can easily use bottled lemon juice since it’s easy to keep in the pantry or fridge. Either will work, but you really need the lemon in my opinion. If you forget it, feel free to use another citrus juice or even vinegar could work. 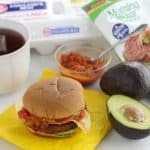 This is so quick and easy to prepare that you don’t really need to do anything in advance. If you buy store-bought pesto, you obviously don’t need to do any preparation. However, you can make pesto in advance if desired. I like using this recipe for a budget-friendly spicy pesto. I’m not a huge fan of reheating cooked salmon because it can get tough and overdone, especially in the microwave. However, this is actually pretty tasty when it’s cold. And if you don’t mind it being a little overcooked, you can easily reheat in the microwave at 30 second intervals until warmed through. Store in an airtight glass or plastic container in the fridge for up to 3 days. 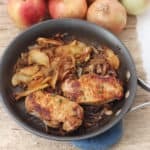 How can you scale the recipe? 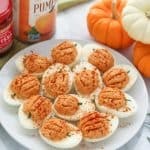 This recipe is easy to cut in half or multiply. Basically, you need one tablespoon of pesto, one teaspoon of lemon juice, and one teaspoon of olive oil (if using) per salmon fillet. Oh, and a little sprinkling of salt, too. 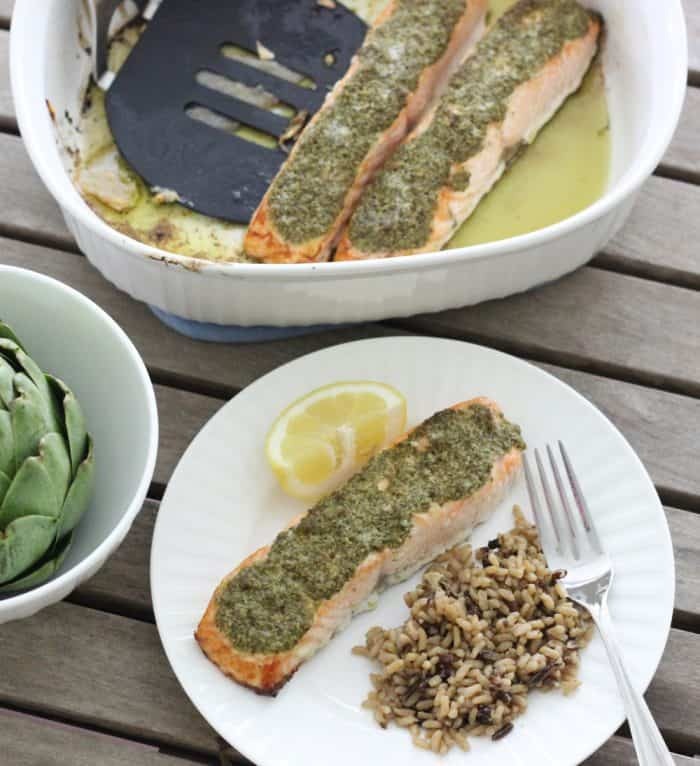 You can serve this Pesto Salmon with whatever veggies and/or grains you like. Brown & wild rice with steamed artichokes were what I served with it because they were already cooked and in the fridge. 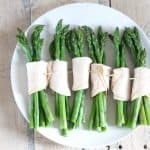 Other great options that cook in less than 20 minutes are Vegan Creamed Spinach, Sautéed Broccolini, 5 Spice Baby Bok Choy, Broiled Parmesan Tomatoes, Sautéed Green Beans, and Rosemary and Garlic Carrots. This recipe is so simple and delicious, that you should go ahead and run to the store to grab a few salmon fillets. You probably have all the other ingredients in your kitchen. Then you’ll have this tasty, rich, and satisfying salmon ready in under 20. Rub one side of the salmon with olive oil (this step is optional). Arrange the salmon fillets in a baking dish or baking sheet with the oiled/skin side down. Rub one tablespoon of pesto over the top of each salmon fillet. Squeeze the lemon juice over pesto. Sprinkle the salmon with salt. Transfer salmon to preheated oven and bake for 10 minutes. Turn the oven to broil and broil the salmon for 5-8 minutes until salmon is done and pesto is lightly browned. Enjoy! Place the salmon skin side down in the baking dish. If using salmon with skin, you don't need to use olive oil. If using skinless salmon, I recommend rubbing one side with oil and placing the salmon in the baking sheet oil-side down. This post was originally published May 30, 2016. Text, recipe, and photos have been updated.